At TRAXXALL, we have built the maintenance tracking industry’s best and most experienced group of aviation analysts, including a team with deep expertise in Bombardier business aircraft. Unlike some of our competitors, TRAXXALL’s “peer-to-peer” analyst service is staffed 24/7/365 by aviation experts who are A&P mechanics and have actually worked on Bombardier Learjets, Challengers, and Global Express. Operators in over 35 countries, including Bombardier aircraft owners like Executive Fliteways Inc., QuikTrip Corporation, Nomad Aviation, Champion Air to name just a few, trust TRAXXALL for maintenance tracking. Vittorio Armenti, Vice-President of Quality Control and 25-year veteran of the aviation industry was Manager of Bombardier Maintenance Tracking Services (CIMMS). Giovanni Montanaro, Director of Operations, was a Bombardier Business Aircraft analyst and has over 20 years of business aviation experience. Alex Li (Li Yingxin) who is a former airline Head of Compliance and a Challenger 850 expert. Please complete and submit the form below to download a copy of our fixed-wing brochure. 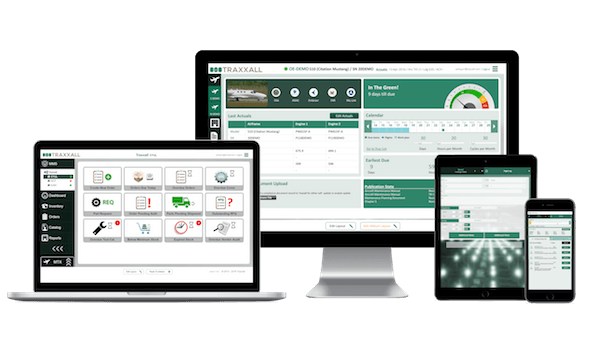 Built from the ground up on the latest technology by a team with deep aviation experience, TRAXXALL is the new standard in maintenance tracking software for business aviation. Whether you operate Learjet, Challenger or Global Express series aircraft in your fleet, TRAXXALL provides the customization, flexibility, data accuracy, and expert analyst support you need from your aviation maintenance software. Our seamless, customer-centric enrollment process means we get you up and flying sooner so your maintenance team can benefit from all that TRAXXALL has to offer. Whether coming from CAMP Systems or another maintenance tracking system — every TRAXXALL enrollment is performed efficiently, accurately, and in its entirety by a qualified Maintenance Analyst. In short, we know what you need from us because we have been in your shoes, we have worked on Learjet, Challenger, and Global Express series aircraft, and we understand the day-to-day challenges of maintenance teams. Please complete and submit the form below to download a copy of our enrollment brochure. Not only do we have Bombardier experts on staff, but TRAXXALL has also built core aircraft templates for all Bombardier models. TRAXXALL. We may not have invented aircraft maintenance tracking, but we’re busy perfecting it every day. Schedule a hassle-free demo to learn why award-winning TRAXXALL is the ideal maintenance tracking solution for your Bombardier business aircraft. Not only do we have Bombardier experts on staff, but TRAXXALL has already built core aircraft templates for all Bombardier models.